The very first Enrichment* activity I went to when I first moved to TN, 3.5 years ago, was a sit and craft type of activity. I had just moved to Murfreesboro, I was 8 months pregnant and didn't bring a craft to work on. Instead I went and got to know some of the other ladies in our church. One of the ladies (Kim R.) was working on something I had never seen before. That was my introduction to quilling, and I have been wanting to try it ever since. My awesome SIL recently gave me just the push I needed when she sent me a link to a beautiful quilled snowflake ornament. I just had to give it a try. 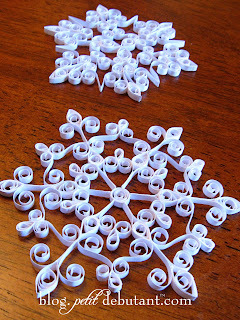 I'll be honest, it's addicting to roll the little strips of paper, it's even easy to make the little shapes... and it can be totally frustrating trying to glue them all together to make a beautiful shape! Here are the two I have made. The one in the foreground is the first one I made. I love it! It took along time to glue the pieces together and following the pattern was more of a hindrance because it really brought out the perfectionist in me. If you want to try quilling go for it! It is a pretty cheap craft to get into and there are so many amazing designs you can make for cards, scrapbooking, ornaments etc. All you need is a quilling tool (one with a slit is great for beginners) - about $4, some quilling strips of paper - about $2-$3, some glue, some pins, a piece of card board, and some saran wrap. That's it! I got a snowflake kit from Hobby Lobby that included patterns, basic instructions, and paper for about $3. I also used a 40% off coupon on the quilling tool. * Enrichment (as it used to be called then) are group activities held by The Church of Jesus Christ of Latter Day Saints that are for Women only. It is time to get together with other women and to learn new skills and become better friends. Those are stunning!I really want to try one out. I have to buy thread this evening and I'm going to keep an eye out for a kit! Hi! I'm so glad you finally decided to try quilling. The very first piece I ever made was also a snowflake. Check out my web site www.Whimsiquills.com for lots of free information and patterns; remember as you go through the photo gallery, that I also started with snowflakes. In my blog www.quillingwithwhimsiquills.blogspot.com , I feature some really neat quillers from around the world as well as some "how to" information. Enjoy and keep on quilling! Those are beautiful! I am in love with snowflakes so I especially loved these! Maybe I should let you talk me into learning how to quill! WOW!! is there anything you can't do?! I to love snowflakes, these are beautiful. How gorgeous! I was just at Hobby Lobby yesterday - I guess I'll have to go again! Thanks for the inspiration! 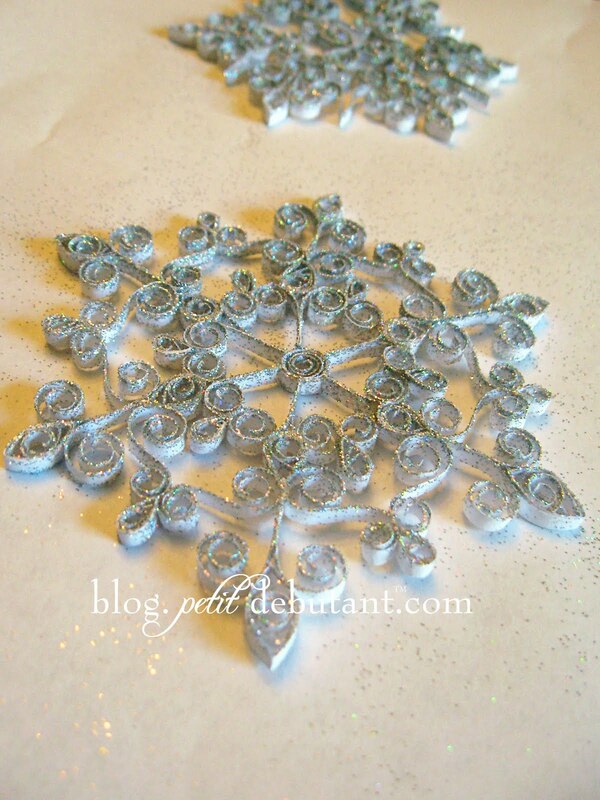 I wandered over from the Sew Mama Sew giveaway, and WOW, these snowflakes are gorgeous!! I've just emailed this post to my paper-crafty friends. Did you post the link to the tutorial and I'm missing it? If not, could you?These look great!